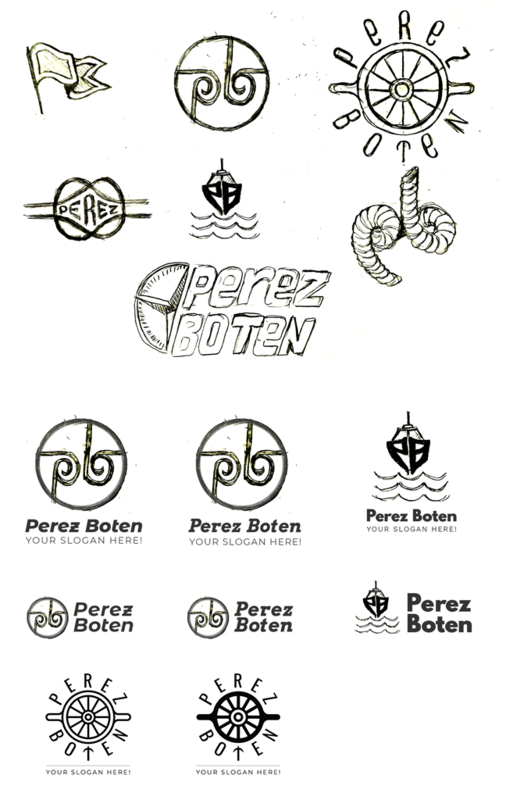 Perez Boten is a starting company from Netherlands, offering second hand boats at an affordable prices. They sell mainly motor boats made of polyester. The company also offer transporting, mechanical maintenance, painting of boats etc. 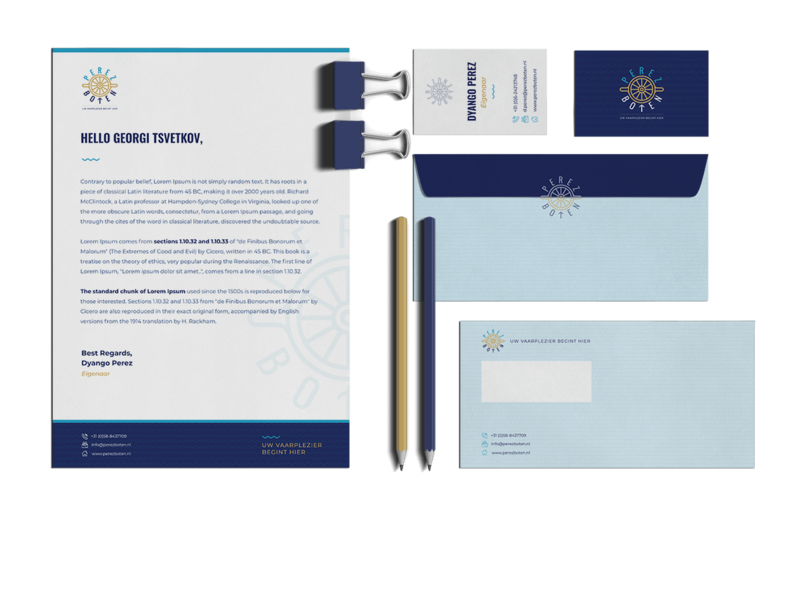 The client needed logo design and basic branding package. 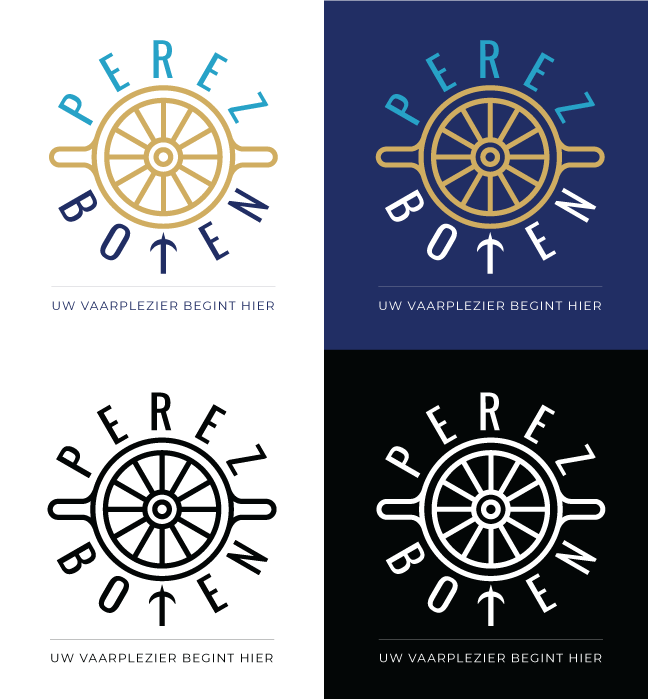 The main challenge for this project was that client wanted to escape from the stereotypical logos having a boat silhouette, so I had to come up with other concepts and symbols related to sailing. Target users for the business are adults in the age between 45 and 65, so that the brand had to be serious, mature but also we had to keep it away from luxurious because the boats are second hand. The client already had some color scheme in mind so my part was to check if colors had enough contrast and go well with each other and tweak them if necessary. I started the project by researching competition, and speaking with people that do sailing in order to get information for suitable symbolism. Next I started sketching different concepts on paper, including monograms which was one of client's preferred type of logos. I sent over the most suitable ones. It was difficult for the clients to chose between 3 of the concepts so I had to show them different variants with fonts in order to find the most suitable one. 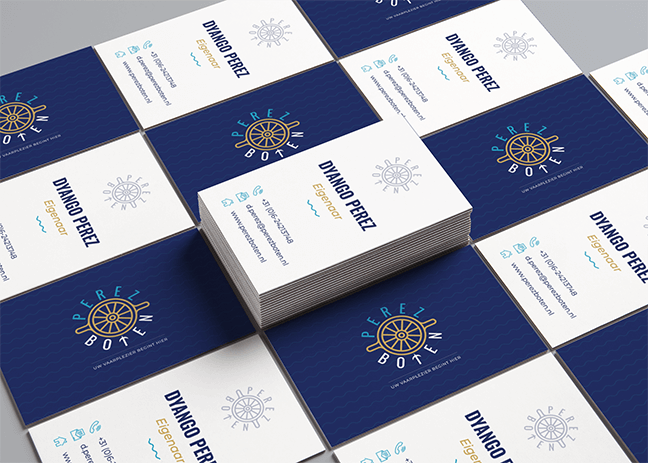 The client chose the Rudder logo. I used condensed font, because only condensed ones will fit the requirement of letters to be taller than wider and thus resembling the handles of a rudder. For the headings and the name in the logo I chose Oswald typeface and for the main text it was Montserrat. Another cool detail in this is that we decided to tweak the letter "T" to look a bit like an anchor so that it will add more to the feeling of sailing. Then I worked with different colors for background and elements in order to deliver a logo that can be used and readable in various situations. Next step was to think of a background pattern that could fit the symbolism and give more character to the brand. I came up with a simple wavy lines that resemble the sea. This was also used in the business cards design. 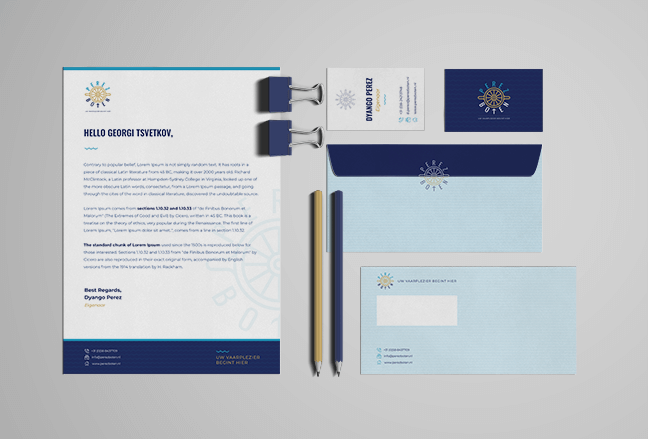 Finally I delivered an envelope and letterhead design to complete the basic branding package. Having all the elements together I checked again for consistency and did changes in nuances of envelope and text color in order to have everything unified and blending perfectly. Georgi was exactly who we were looking for. We spoke to a couple designers beforehand but we’re happy ending up with Future Nature! What a great and quick process! He came up with different design concepts that we could choose from as final design. We’re really pleased with our logo and branding!